Despite my many warnings to the boys about the borderline quality of their behavior leading up to Christmas, Santa came anyway. Nobody can be counted on to give 102nd chances like Santa. We had a typical Christmas for us. It began with a mega-dose of childish excitement and glee. Then it slowly spiraled into the danger zone known as Too Much Christmas, when three boys, overstimulated and full of adrenalin, can’t process all the new things to play with and turn into Tasmanian Devils. 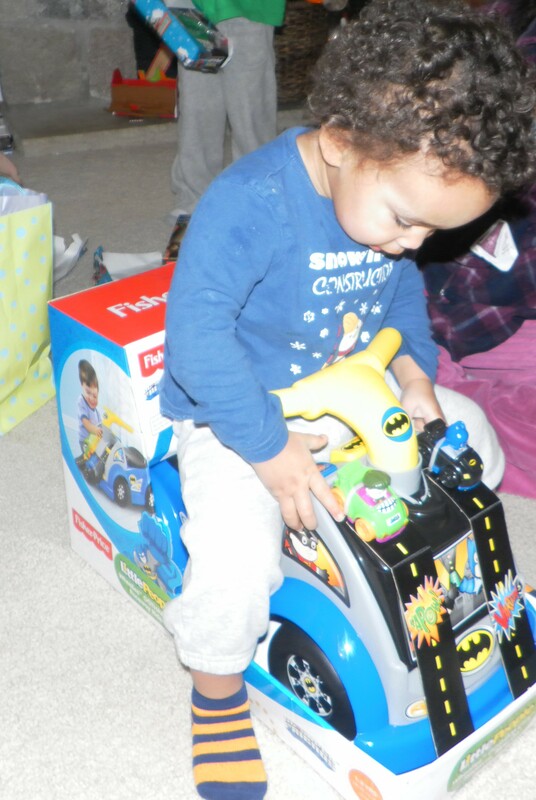 When Christmas is still fresh and new – before the abundance of toys overloads any synapses. Just think how fun it will be out of the box! A small cooling off period sets things right again, or as near as they can be on this day of frenzy. Then it’s the battle to make them sit down long enough to eat some dinner. Fortunately, Big Brother has inherited his father’s unconditional love of the ham. He’d eat it in a box with a fox, or even during the excitement of Christmas Day. It’s only the little ones who can’t see the majesty of the glazed shank beyond the shine of new toys. About mid-afternoon begins the parental strategizing about how to wear them down so they’ll go to bed at a decent hour, in spite of all the fun stuff calling them to wakefulness from the living room. The day ends with a drink of Daddy’s new scotch, conveniently delivered by the UPS man on Christmas Eve. If there is a Santa, I’m now convinced his suit is brown rather than red. And what a scotch it was. This new one is potent. It tried to put hair on my chest. It didn’t realize that my chest is a difficult place put hair. The most difficult place is my head, which retired from hair farming some years ago. At my age, that scotch would have been far more successful seeking fertile ground on my back, but liquor attempts only what it’s trained to do. In the days following Christmas, things have settled down some. Some. We still have fights between Buster and Big Brother over the best use of certain toys. Big Man keeps everybody on their toes with his penchant for disassembling LEGO creations whenever one is left unattended and within his reach. This causes much gnashing of teeth, yet never causes anyone to learn to keep their LEGOs up high. There used to be a laser turret here. 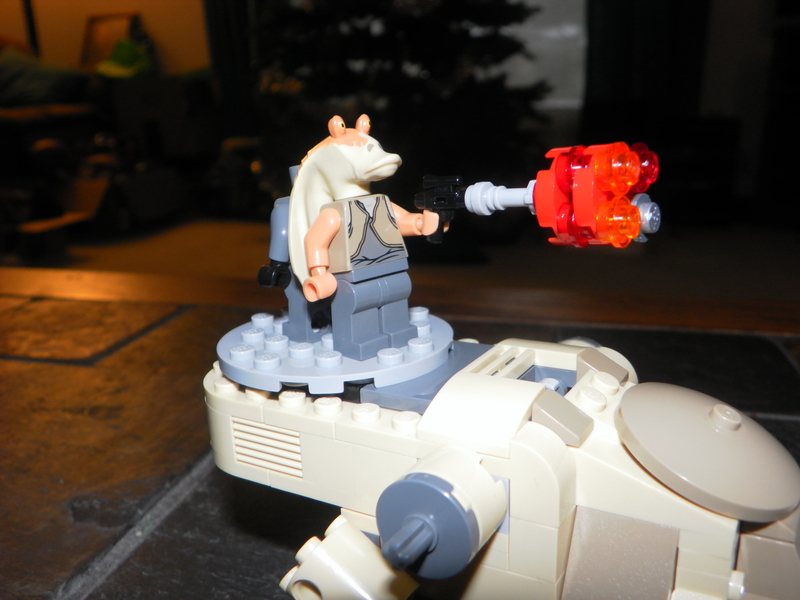 But after Big Man tore that off, Jar Jar makes a good substitute. Pieces are broken or lost. This is the natural order of things. Instinctively, they are making room for the next Christmas. On the third night after Christmas, Buster considered his built, then unbuilt, then half-built again LEGO toy. “Daddy, “ he said. There’s a little Buster in me that always wants more Christmas too. But when the Daddy in me reflected upon the dizzying roller coaster that is Christmas with three boys, even my inner child shook his head. There’s not enough scotch in the world for that. This entry was posted in Holiday Hijinks and tagged boys, children, Christmas, Dads, family, fatherhood, humor, parenting, Santa Claus, Sons. Ha! As long as next year doesn’t come too fast! We’ll be sure to wait until very near the end of it. Well that brings a little peace of mind. Looks like you guys had a lovely Christmas. I seem to remember a funny post from you awhile back involving scotch – glad this one arrived on time 😉 Happy New Year once again 🙂 Cheers. You never want to be caught without your scotch. Cheers! Excellent! 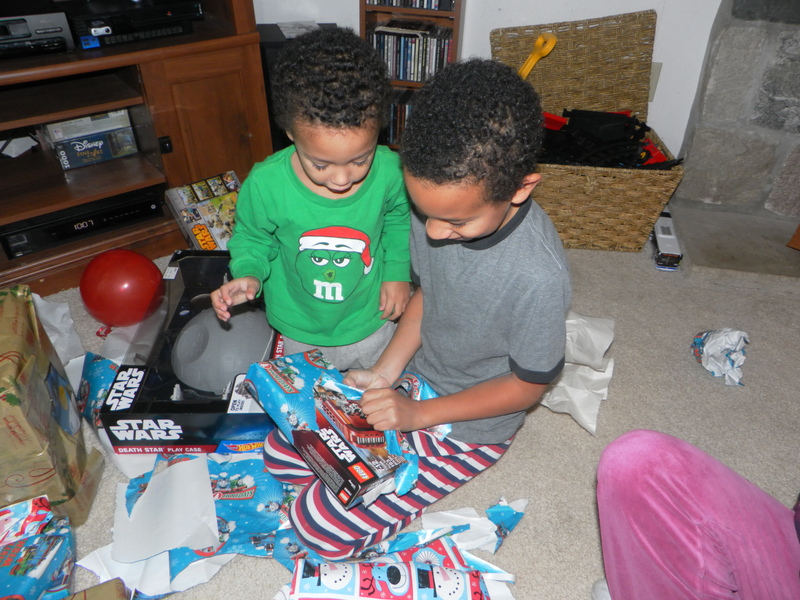 Looks like Christmas could not have been better….lost Legos and all! I won’t complain . . . any more than I already have. This is funny! Not sure if this is good news or bad, both my kids 15 and 18 commented this year about how Christmas is kind of boring. Yep… sounds about right! They could make it more exciting by getting you more presents. Just something for them to chew on. Our Christmas morning was frightfully quiet this year as our (grown) children were at their in-laws. I know it can be an exhausting day for parents but I miss those chaotic days with the excitement of little ones! Wishing you & your family the very best in 2016! You can come babysit next year. I’m pretty sure they’ll still be in shape to provide plenty of excitement. Happy New Year. I just hope they’ll keep in mind how fast a father can grow senile. They should cherish this time while I’m still young and cute. You have reminded why I shouldn’t drink scotch. Always enjoyable to read your blog. Happy New Year! We all have our little helpers. Always nice to know you’ve read. Happy New Year to you! Our kids got cash under the tree as our Santa is one lazy old fart. So the whole family just got together and ate. Not each other, food. And we ate a little more. And we were still eating three days later. Then I went to the loo for a poo. It was great. I love Christmas!! Too bad you don’t get up hours before the sun to go to a gym or anything. You’re going to need some exercise. Wait, are you saying what I think you’re saying? That Santa is actually me? We like to do it up right around here. Scott, I just said to my husband oh I am so glad we did not have children! I honestly do not know how you do what you do. It’s a labor of love, Amy. And in spite of how tiring it can get, I never end a day thinking they are not worth it.